It is finally time. You have decided that enough is enough and you want to be symptoms-free, full of vitality, healthier and happier. Every diet you have followed so far has sold you miracle ways to shed your extra weight, and yet, you always get back to the same old ways and exactly where you started. You have been on a rollercoaster of pain and discomfort and now you just want the good days. Well, then it is time to join me on a 30-day adventure. By your side, I will also follow the plan, and give you all the tools you need to succeed in reaching optimum health so that you can finally be you: healthy, happy and full of vitality, and for many of you, symptoms-free. The support pack contains 100 pages of important information and fully-referenced handouts. There are also an extra 50 pages with weekly menus and massive bunch of tried-and-tasted delicious recipes, shopping lists, and recommendations. You will also find a monthly schedule (never supplied with any other program), a daily schedule, snacks and sides ideas; all packed with cooking tips, cook notes, and much much more to keep you motivated and on track. The 30-Day Reset is not a fad diet, where you are expecting to loose weight and take it all back once the diet period is over. This Diet is a way of life, and it will send you on a path towards health. You will reach your ideal weight naturally, and stay that way. But it is only s stepping stone. The plan may be difficult during the first few days; however, if you stick to it, you will never want to eat the food you eat today; the food that you know makes you sick; the food that are silently wrecking havoc on your inside. Do not worry, if you think you cannot cook. I am supplying you with all that you possibly need: a plan, menus, recipes and shopping list. I will also be adding extras and bonuses to motivate you along the way. ​To stay up to date, you can join me all other participants on our dedicated group page on Facebook. You will be able to ask questions, share your experience and get the motivation you may need at times. You may even want to share your own recipes or alternatives to the suggestions given in the plan (as long as all the foods used are in the 'Foods to Include' list. Do not delay. Join Today! Surprise your loved ones with a New You: Healthier, Happier and full of Vitality. Join our Exclusive Facebook Group. Setting you on a new path toward health, right in time to help you set your New Year resolutions. What a way to start a new year, right? You will be a Hero! The hero of your own journey! Healthier, Happier and full of Vitality. Why register for a 30-Day Reset Plan? There is no better program than the 30-Day Reset, which is proven to work and promoted by Functional Medicine all over the world. 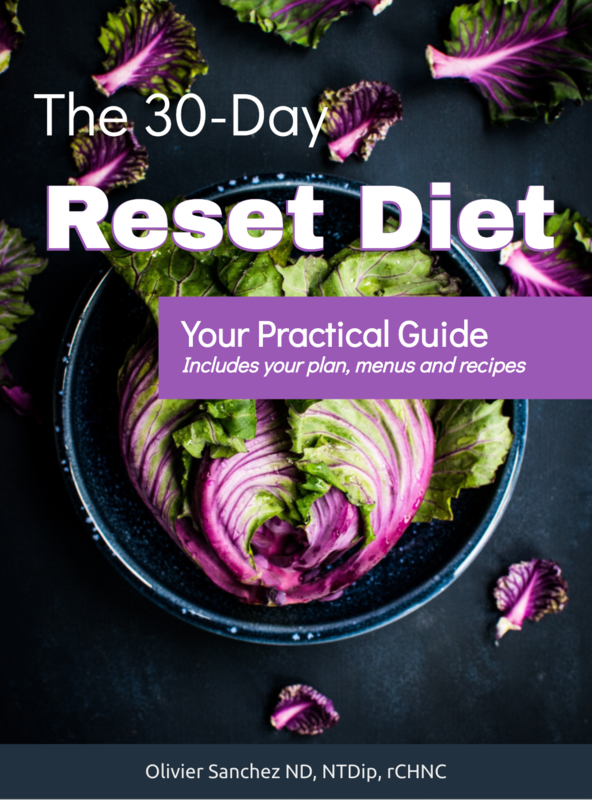 The 30-Day Reset program will allow you to identify intolerances, taking the main culprits such as grains, dairy, and sugar out the diet. This will allow for your body's immune response to be retuned and, as a result will boost your immune system. The program will also regulate your blood sugar balance and as such will help you manage your energy levels, your productivity, and mood as a whole, and subsequently will allow you to sleep better (to fall asleep and stay asleep). Intestinal cells need about 21 days to regenerate new and healthy cells and rid the body of inflammation, starting in the gut. Health starts in the gut! By eating foods that are known to be safe and nutritious for the body, you will supply these new cells with the raw material they need to function optimally. It takes two weeks to retune your tastebuds, and by reducing sugar and table salt you will experience flavours like you would as a child. In 30 days you have fully silenced your cravings, setting you on a new path you are likely to follow.